Dreamers Beauty Clinic has been delivering you skin results since we opened 20 years ago. Our goal is to provide both superior customer experience and tremendous value for our clients. 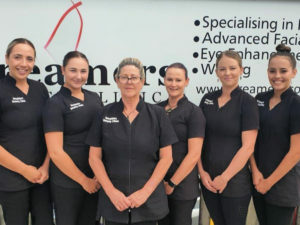 Dreamers is located in Katikati town centre and is owned and operated by Suzanne Bullivant who has 38 years experience in the Beauty and Body industry. Suzanne’s amazing staff Jo, D’Arna, Tahlei and Kayla make Dreamers a solid and passionate team. With an ongoing commitment to training to keep up with the latest techniques, Dreamers is a safe and caring clinic to visit. Qualified Beauty Therapist with 40 years experience. Suzanne is proud to be the owner of Dreamers Beauty clinic and is totally committed to making your visit to Dreamers memorable. Suzanne will ensure that all her staff are experienced and qualified to meet the standards required. Hygiene is very much a high priority, as well as friendly, caring staff. Dreamers success is Suzanne’s passion. Book an appointment with Suzanne online. Salon Manager and very experienced Beauty Therapist. Jo McLachlan is our salon manager with over 20 years experience. Jo is a very confident and caring therapist for our clients. Her loyalty and passion for Dreamers and her clients make Jo an exceptional staff member. Jo specialises in all fields of beauty therapy. Jo’s confidence in her work makes her a perfect therapist for new clients. Book an appointment with Jo online. Beauty Therapist and Nail Technician. D’Arna is a huge asset to Dreamers with over 9 years experience. D’Arna has an eye for detail which gives her a leading edge with her love of nails. D’Arna specialises in nails and also has a huge interest in skin and the science behind how the skin functions. A very confident and caring therapist. Book an appointment with D’Arna online. Kayla is Dreamers Eyelash Extension Technician from Auckland and specializes in all our Eyelash treatments here at Dreamers. At Dreamers Beauty Clinic we are driven to provide to every client who walks through our doors, exceptional service, technical excellence, and expert advice with the utmost professionalism. We show clients that we genuinely care. We promise to make every client stay memorable and to go the extra mile to make this mission statement true.